Children have entered your life, and now you’re thinking about your first family ski holiday — but where do you start? What childcare options are available? How old do children have to be to join ski lessons? And where’s the best place to go? If you’re going skiing with your children here’s an introduction to all the options, and some key points you’ll need to consider. A mid-sized resort or larger will provide the most extensive options, especially if English-speaking childcare and tuition is important. Childcare is available from a very young age. Some nurseries will take babies from four months onward, although a six-month lower limit is more common. Ski lessons start from age three but it’s worth noting that they don’t really learn to ski at this age. Instead, it’s more about playing with skis on, and getting used to the idea of having skis attached to your feet. From the age of 5 children start to learn to ski properly. Younger children generally do a half-day ski lesson, then join a kids club for the other half of the day. Half a day’s skiing is plenty for most young children, and this system is by far the most common. From about 8 years upward children start to move towards either full or half-day lessons, leaving them free to enjoy skiing with their parents in the afternoon. Snowboarding is a more demanding for beginners, so children need to be much older before they’re allowed in lessons. Eight is the very youngest, although to make much progress it might prove to be a better option if they wait until the age of ten. Look out for resorts which have been awarded the Famille Plus label. See below for details. 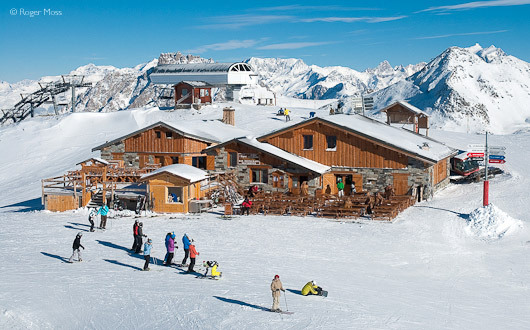 Resorts which offer accommodation available close to the child-care and ski-school meeting points. Other indoor activities are important for young children. Look out for resorts with aqua centres with kids’ areas, special entertainment and early evening family events including firework displays and torchlight processions. There’s a bewildering choice of family ski companies out there, whose package includes in-house childcare. They employee nannies and often have nurseries within the chalet accommodation. This is the simplest for parents, since everything is taken care of — staff will collect your children in the morning, take them to their ski lessons, pick them up again afterwards and take them to lunch before offering an afternoon kids club until you return home. However, don’t underestimate the expense of this option, especially as there can be lots of unforeseen extras. Most ski resorts have a local nursery, which can be the most economical way to find childcare. They are usually run in conjunction with the ski schools, so all the timings tend to work for ski lessons. For older children they’ll often run a kids’ club too, so you can drop your children off in the morning — they’ll then be taken to ski lessons, given lunch afterwards, followed by an afternoon kids’ club. Generally you’ll find a mix of French and English children together, and most staff speak both languages. 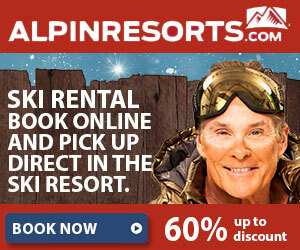 The main advantage here is price; it’s far cheaper than using a specialist family ski company. You do have to drop off your children and pick them up, though, and they can become fully-booked for the big French school holiday weeks, so do check availability — and book well ahead. There are companies providing nannies who will come to the chalet to look after your children. Not surprisingly, this is relatively expensive, but if there are a few of you then the price rapidly divides down. You should, however, confirm that this kind of arrangement is acceptable to your chalet provider before booking anything. It’s also better if your group is occupying the whole chalet, rather than sharing it with other parties. Ski schools can often arrange some of the extra childcare. 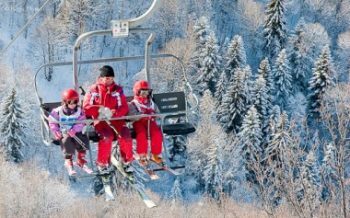 For example, older children (8 yrs+) may be offered a lunch service, so the ski monitors will supervise your children during lunch in a local restaurant, bridging the gap between morning and afternoon lessons, and leaving parents with the whole day free. 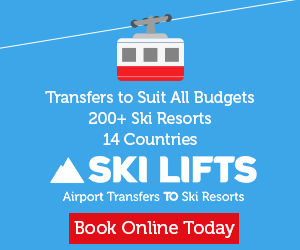 This does depend on the ski school and resort, but where available it can be a hassle-free and affordable option. 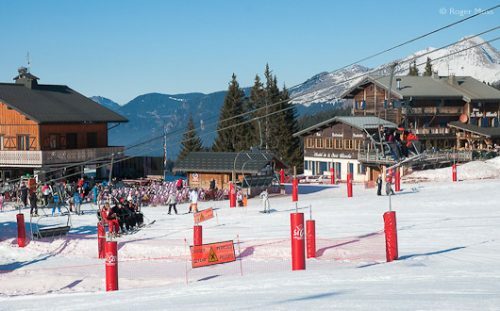 The ESF (Ecole de Ski Français) is the biggest ski school in France, with 17,000 instructors, nearly half of whom are English-speaking. Toddlers begin in their Piou-Piou Club, progressing to group lessons from 3 years of age. All children are rewarded with achievement medals at the end of the week. 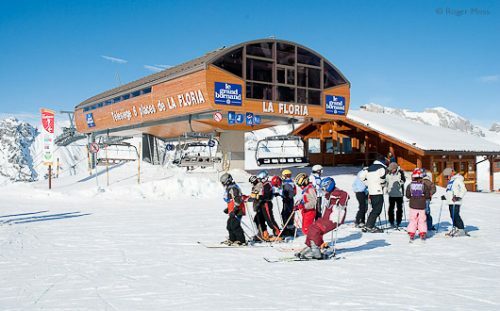 In larger resorts the ESF may host a nursery (garderie) and a kids’ club (club-loisirs) for children from 3 years and older. Note that it’s important to pre-book places for your children, especially at peak times. Other ski schools include ESI (International Ski School) and British ski schools such as SkiNewGen (New Generation Ski & Snowboard School) and BASS (British Alpine Ski & Snowboard School) plus others. 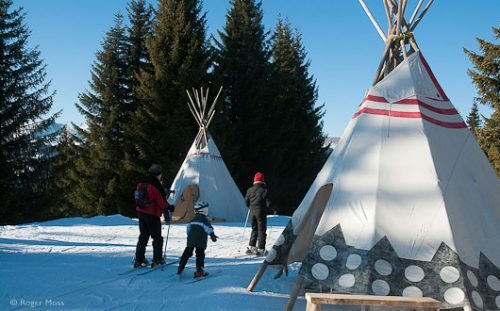 Although some resorts are better than others for family ski holidays, just about all of them offer childcare facilities. Look out for resorts which have been awarded the ‘Famille Plus’ label, as they guarantee a welcome for families, along with special services and activities for all ages. If you are going with a specialist operator then don’t worry; they’ll ensure that everything is available for you. Otherwise think about staying in a low- or mid-altitude resort. Young children generally don’t enjoy being in the kind of sub-zero whiteouts you can get above the treeline (about 1800m in France), so a village at lower altitude could be a good starting-point in choosing your resort. Try Les Gets or Morzine (Portes du Soleil), Les Carroz d’Araches or Samoëns (Grand Massif), Mégève (Evasion Mont-Blanc) or Monêtier-les-Bains (Serre Chevalier). 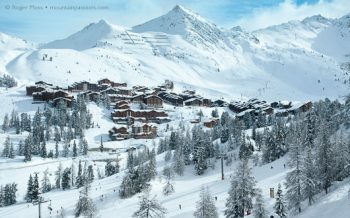 Also worth considering is resort size — tiny resorts will have fewer facilities and options, if you want to use the local nursery or ski school childcare (and may be limiting for parents who ski) but if you like small and friendly resorts try Puy Saint Vincent, Arêches Beaufort, Combloux, Aussois, La Norma or Le Devoluy. 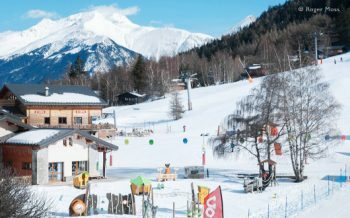 Linked resorts (villages with links to large ski areas) could give parents the mileage they crave yet provide the village type atmosphere and childcare for the youngest family members.Try Crest Voland (Espace Diamant), Montchavin Les Coches in La Plagne (Paradiski), Vaujany or Oz-en-Oisans (L’Alpe d’Huez), or La Toussuire (Les Sybelles) with easy lower slopes near the village (pictured above). A mid-sized resort or larger will provide the most extensive options, especially if English-speaking childcare and tuition is important. 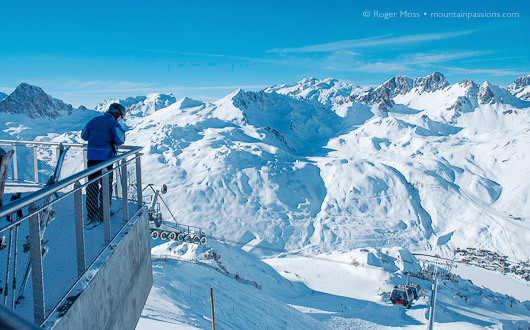 Try Les 2 Alpes (picured above) which has a free and enclosed learner area, easy slopes at altitude and family ski cross, La Clusaz or Le Grand Bornand (shorter travel times from the UK), La Rosière, Valloire, Val Cenis Vanoise, Les Saisies, Les Menuires (Three Valleys), and Avoriaz for a traffic free village with learner area at it’s heart. The label is awarded for 3-year periods. Holders undergo regular audits to ensure standards are maintained, and can renew their membership only if the criteria continue to be met. The label ensures that accommodation providers plus child-care and other professional staff work harder at providing the best possible welcome for families. Famille Plus ski stations offer a season of family entertainment and activities. Events are publicised at the tourist offices, or you can visit the Famille Plus website and see the relevant programme for your chosen destination. Visit the Famille Plus website for details of all their mountain destinations (currently in French only). 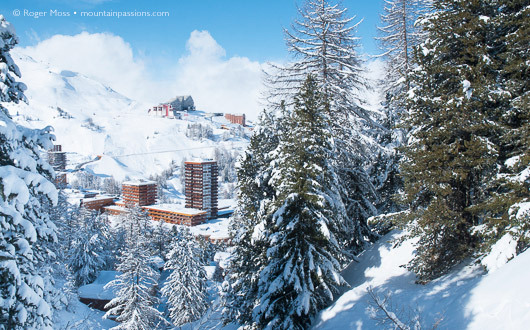 See our review of La Plagne, suitable for any level of skier and particularly loved by families for it's ski-in ski-out convenience, range of accommodation options and plenty of activities. 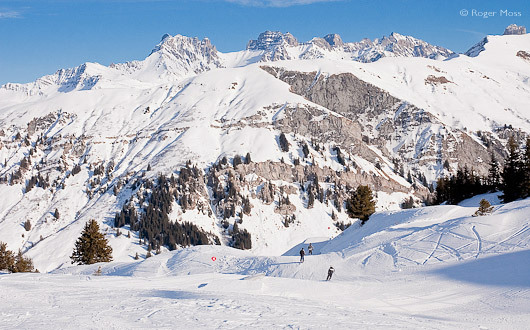 We loved it for the huge amount of skiing on offer, the lower villages with tree-lined pistes and the fun atmosphere. The super village atmosphere at Valloire won us over, and then we discovered the skiing on offer and we were totally convinced. Linked to nearby Valmeinier, there's plenty of terrain for everyone and beginners will enjoy a great choice of green and blue runs. 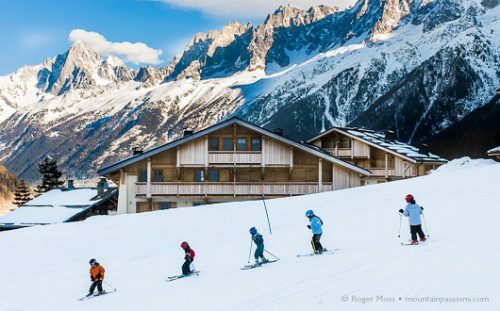 With activities every evening, ski school on the front de neige and access from your accommodation onto the piste and the pedestrianised village centre, La Norma won us over as one of the best family resorts we've skied. Easy access, spectacular views, good altitude and some challenging slopes, plus very reasonable prices - a complete family ski package.